Looking southward at the U.S. 31 (St. Joseph Valley Parkway) freeway from the Plaza 72 access road between it and the Indiana East West Toll Road. Photo taken 09/02/05. The St. Joseph Valley Parkway is a freeway bypass of the Michiana metropolitan area (South Bend, Mishawaka, and Elkhart). It was conceived as a bypass route for U.S. 20 and U.S. 31 and since the completion of the Parkway, those routes have been moved to the bypass with business routes inside the Parkway. 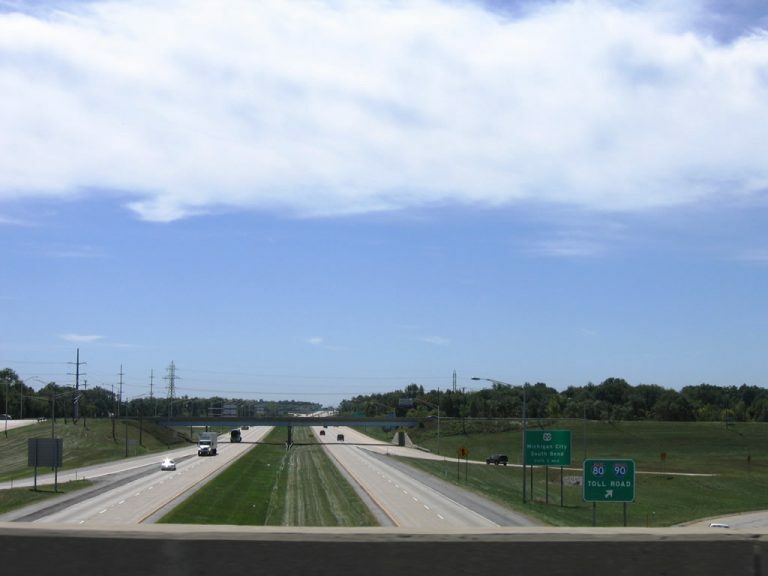 Along with the Indiana Toll Road and Elkhart County Road 17, the Parkway completes of beltway of sorts around the Michiana Area. The name of the highway comes from the St. Joseph River, which flows through Elkhart, Mishawaka and South Bend before flowing up to Benton Harbor and into Lake Michigan. With that in mind, the highway applies to the U.S. 31 freeway in Berrien County, Michigan as well. The Michigan segment is mostly complete with the exception of a 2-mile gap that will connect it to Interstate 94. Despite the name, locals are more likely to call the highway as U.S. 31 to the west of the U.S. 31 South/Michigan Street interchange in southern South Bend, and U.S. 20 to the east of the interchange, or simply call it "the bypass." The Parkway was built in several stages with the first segment from Indiana 2 to U.S. 20 completed in 1962. The segment from Indiana 2 eastward to U.S. 31 was finished by the mid-1970s and the part from U.S. 20 north to the Toll Road in 1979. In the 1980s U.S. 31 was rerouted to the new freeway. The segment from U.S. 31 east to County Road 17 in Elkhart County was worked on in the 1990s. Once this was finished U.S. 20 was rerouted to the new freeway. Throughout the years the highway had been signed as Bypass U.S. 20, though this designation is no longer official. Another way to judge the age of the highway is how it was constructed; the original sections from the southern U.S. 31 interchange to the west up to Michigan were done in asphalt while the section to the east out to Elkhart was in concrete. The Michigan segment was constructed over various years with the majority of it finished by 2003. Only a couple of mile stretch from Napier Road to Interstate 94 has yet to be completed. Plans are for a connection to be made in the next few years. Once that segment is finished and the Plymouth to South Bend U.S. 31 freeway is built, U.S. 31 will be a freeway from Plymouth to Holland, Michigan. The current highway appears like a modern urban interstate with a jersey barrier in the median throughout and a speed limit of 65. Despite that, the highway is mostly within rural/suburban areas of South Bend, Mishawaka, and Elkhart. For additional information, some of which is sourced on the guides here, see Marc Fannin&apos;s "Routes in South Bend and Metro Northern Indiana." U.S. 31 Business begins at the Brick Road interchange with U.S. 31 (St. Joseph Valley Parkway). The route follows Cleveland Road east from the freeway to Indiana 933 (Dixie Highway) at Roseland, but is inconsistently signed. Pictured here is the signalized intersection of the fledgling business route at Ameritech Drive near St. Joseph Valley Parkway. Photo taken 09/02/05. Westbound at the Cleveland Road (Business U.S. 31) interchange, the control cities for U.S. 31 (St. Joseph Valley Parkway) are Benton Harbor, Michigan to the north and Plymouth to the south. Note the Indiana Toll Road shield on the sign. Photo taken 04/10/10. Second photo taken 09/02/05. U.S. 31 continues north to Niles, Michigan from U.S. 31 Business and South Bend. Photo taken 09/02/05. Cleveland Road becomes Brick Road west at the loop ramp to U.S. 31 south to South Bend and Plymouth. U.S. 31 continues just one mile to a trumpet interchange and access road to Interstates 80 & 90 (Indiana East West Toll Road). Photo taken 09/02/05. Westbound on Western Avenue at the interchange with the St. Joseph Valley Parkway (U.S. 20/U.S. 31). West of here, the four-lane expressway becomes Indiana 2 which travels for 81 miles west to LaPorte, Valparaiso, Hebron, and Lowell. The control cities for the northbound parkway are Michigan City (for U.S. 20) and Niles, Michigan (for U.S. 31). The controls for the southbound parkway are Mishawaka (for U.S. 20) and Plymouth (for U.S. 31). Photo taken 04/10/10. Southbound on Bremen Highway at the interchange with the St. Joseph Valley Parkway (U.S. 20). Traffic heading west for South Bend and Michigan City are directed toward the right (east) with traffic bound for Elkhart up ahead on the other side of the parkway. Photo taken 04/10/10. Southbound on Bremen Highway on top of the bridge spanning the St. Joseph Valley Parkway (U.S. 20), a guide sign directs traffic bound for Elkhart on eastbound U.S. 20. Photo taken 04/10/10. Northbound at the northern terminus of U.S. 33 at the St. Joseph Valley Parkway (U.S. 20) in Elkhart. Eastbound on the parkway, the control city is Angola; the county seat of Steuben County located about 50 miles from here. Photo taken 04/10/10. Northbound at the northern terminus of U.S. 33 at the St. Joseph Valley Parkway (U.S. 20) in Elkhart. Westbound on the parkway, the control cities are Mishawaka and South Bend. Note in the distance the two "End U.S. 33" shields. Since 1998, U.S. 33 has ended at this location. Photo taken 04/10/10. 09/02/05 by AARoads. 04/10/10 by Thomas Decker.